This is a fairly common situation in everyday life – you start your washing machine, the indicator is on, but no water comes in. Or there might be a similar problem – the water comes in, but there is too little of it, and the process of washing can take a long time. If the water does not fill your washing machine at all, or it comes too slowly, first of all, check the water supply system and the pressure in it. Once you make sure that your plumbing is okay, pay attention to the water supply hose. Hose filter. It is designed to protect your appliance and does not allow any garbage to get into the washing machine. If the filter is clogged, water may not flow in, or it may come very slowly. Water supply valve breakdown. This is a mechanical fault that may occur for various reasons – burnt coil, clogged filter, etc. If it is a coil, you need to simply replace it. If the appliance does not fill water, or it does not fill enough water, the problem may have to do with the pressure sensor (or pressure switch as they often call it). This sensor keeps track on how much water got into the washing machine. 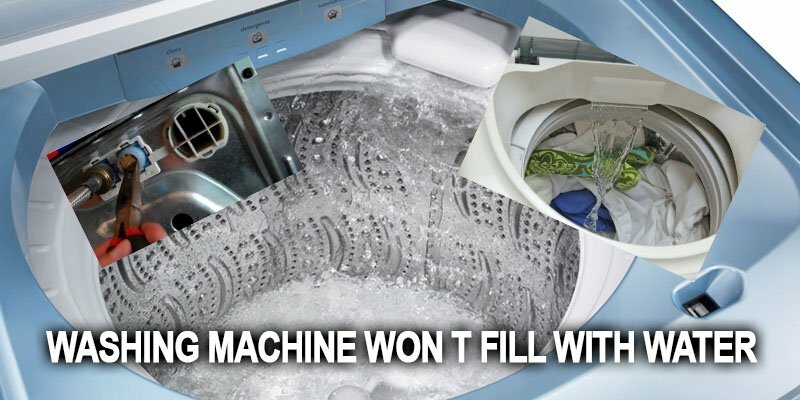 If there is no water or not enough water in it, your washing machine will not turn on. Accordingly, if the sensor is not able to check the water level, the fluid will get into the tank. In this situation, you will have to replace the sensor. Failure of the door lock often becomes the cause of malfunction as well. To solve the problem, you will need to replace the locking device. But the door may fail for other reasons as well. For example, if the door hinges are loose, or if the latch responsible for securing the door has been damaged.